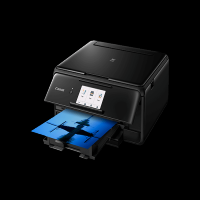 The Canon Pixma TS8150 printer is 30% smaller than its previous models with 139mm high, 372mm wide and 324mm deep. This printer with small footprints can easily fit into your office desk or in your study room. This Pixma printer is designed with a dual feeder in which one can easily feed photo paper (in the rear) and plain paper(in the front cassette) at the same time. The printer provides a good quality print with 6 individual Canon Pixma TS8150 ink cartridges. To reduce the running cost of the printer, XL and XXL ink cartridges are available. The printer offers good printing resolution of 4800 x 1200 dpi and also has an average printing speed of 15.0 ipm for monochrome documents and 10.0 ipm for colour documents. For easy navigation, while printing directly from the printer it has 10.8 cm touch screen. Also, built-in Wi-Fi and Bluetooth provides seamless wireless printing from smart devices. With the back support of Apple AirPrint, Google Cloud Print, Windows 10 Mobile, Mopria for Android, and the Canon PRINT app, one can print the documents more convenient from anywhere. Canon Pixma TS8150 printer is a compact-sized printer loaded with multiple features. The printer has 2 input feeder, a touchscreen display, and separate Canon Pixma TS8150 ink cartridges which add convenience to the printing task. This printer is suitable for performing the printing task for small business and home office as well. What should be done when paper remains black/printing is blurry/colours are wrong or white streaks appear on the paper while using Canon Pixma TS8150? Step 1: Check the paper and print quality stages. Step 2: Check the status of the Canon Pixma TS8150 ink cartridges, replace them if ink runs out. Step 3: Print the nozzle check pattern to determine whether the ink from Canon Pixma TS8150 ink cartridges, ejects in a proper way. If the pattern is not printed correctly, check if the Canon Pixma TS1850 ink cartridge is empty. If it is not empty perform print head cleaning and again print the nozzle check pattern. Note: Before performing the cleaning, the printer should be turned off and the power cords of the printer should be unplugged. Avoid use of volatile liquids such as thinners, benzene or any other chemical cleaner to clean the printer, as it may cause damage to the surface of the printer. If still, incorrect nozzle check pattern occurs, perform print head deep cleaning. If the problem does not resolve even after performing deep cleaning, turn off the printer and perform deep cleaning after 24 hours. Still, if it does not work, the print head may be damaged. You must contact your nearest service centre for repairing your machine. Step 4: Once the Canon Pixma TS8150 ink cartridge is installed, do not remove it from the printer and leave it in open. This will cause the ink cartridge to dry out, and the printer may not operate properly when it is reinstalled. To maintain optimal printing quality, use the Canon Pixma TS8150 ink cartridges within six months of first use. Step 5: When you are using paper with one printable surface, check the correct side of the paper. Printing on the wrong side of the paper may reduce the quality of the print. Step 6: When you are loading paper on the rear tray, load the paper with printable side facing up and when you are loading paper in the cassette, load paper with the printable side facing down. Q. Does this Canon Pixma TS8150 printer supports Linux operating system? A. No, the printer is compatible only with the series of Mac and Windows operating systems. Q. Will compatible Canon Pixma TS8150 ink cartridges affect my print quality? A. The print quality is never affected when good quality compatible ink cartridges are used. You can buy one from here. Q. Can I purchase a multipack of 12 ink cartridges for my Pixma TS8150 printer? A. Sorry, for now, we are available with a multipack of 6 ink cartridges. Hence, you can purchase 2 multipacks of 6 ink cartridges. Q. I’m using Pixma TS8150 printer for my home printing, but the original cartridges are pricey. What should I do? A. Yes, you are right. But to resolve this issue, you can always opt for compatible Canon Pixma TS8150 ink cartridges for your printer. The compatible cartridges supplied from our site produce good quality results at an affordable price and also passes through several tests to match the high-performance standards. Q. Do I need to replace all the ink cartridges if my cyan ink cartridge is expended? A. The ink cartridge system in the Pixma TS8150 printer is very flexible. You only have to replace the expended ink cartridges with the new one. Q. I need a printer which can perform frequent printing task. Will this printer be able to meet my requirement? A. Yes, the printer has an optimum printing speed and it also provides good printing resolution. Hence, the Pixma TS8150 printer can be a good choice. Q. Does the mixing of compatible Canon Pixma TS8150 ink cartridges with the genuine ones will affect my printer’s warranty or print quality? A. The print quality/ printer warranty will be affected if you mix the ink. It may not be affected if compatible and genuine ink cartridges are used together.